MongoDB is one of the most popular NoSQL databases available on the market today — but when used alongside Redis, it can go above and beyond consumer expectations. Whereas MongoDB is a document-oriented, disk-based database optimized for operational simplicity, schema-free design and very large data volumes, Redis is an in-memory, persistent data structure store that enables developers to perform common operations with minimal complexity and maximum performance. The two databases both fall under the NoSQL umbrella, but because they’re built for different purposes, Redis’ distinct capabilities significantly augment MongoDB’s usefulness. 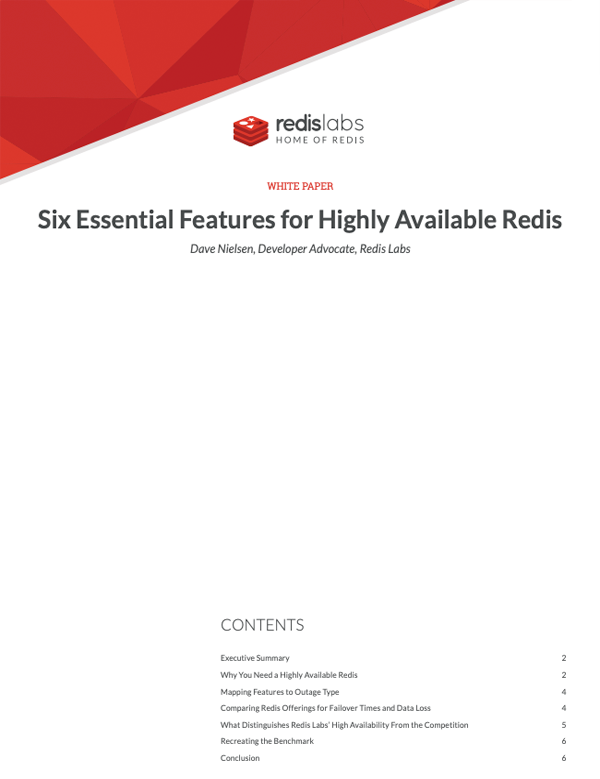 Redis is optimal for a variety of use cases, including user session storage, real-time analytics, in-app social functionality, high-speed data ingestion, and message brokering for queues. Redis is also an intelligent cache with the ability to run Lua scripts, making it ideal for high-speed computations — however massive — in real time. These capabilities are already advantageous on their own, but when paired, Redis with MongoDB can serve as a data ingestion buffer to make MongoDB much more efficient and manage document updates in-memory to reduce MongoDB’s hardware needs. To learn more about specific Redis with MongoDB use cases, please download our white paper. Numerous customers have expressed their satisfaction with the Redis with MongoDB pairing. One real-time analytics service provider uses MongoDB as its primary data storage, but also uses Redis for real-time analysis, calculations and display of the high volume event data that it collects. This service provider uses Redis to sessionize data, and Redis’ Hash data structure assists the organization in processing tens of thousands of real-time updates in a quick and efficient manner. Other companies that supplement their Redis with MongoDB include a virtual navigation service, a massively multiplayer online game, an IoT application and an online dating application. These companies all rely on Redis’ diverse data structures and commands — ranging from Hashes to GEOADD — to perform real-time calculations and process high volumes of updates, while still maintaining their primary storage on MongoDB. For example, the online dating application maintains its user profiles in MongoDB, but uses Redis to track user locations over time. In other words, MongoDB is capable of storing a great deal of data, but Redis can help it process that data in real time. If you are already a MongoDB user, you are already familiar with the lay of the land when it comes to NoSQL databases, and we are confident you will find that Redis functionality and performance perfectly complement MongoDB for real-time, real-world applications. To learn more about what Redis can do for your MongoDB, please download our white paper.